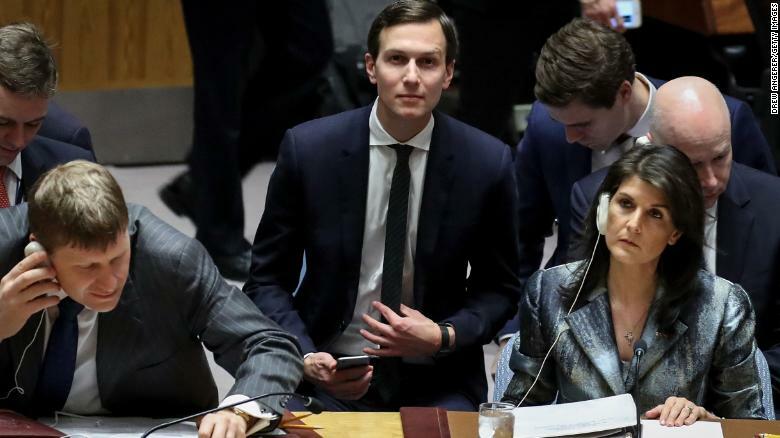 White House Senior Advisor Jared Kushner (2nd from R) takes his seat as US ambassador to the United Nations Nikki Haley (R) looks on before the start of a United Nations Security Council concerning meeting concerning issues in the Middle East, at UN headquarters, February 20, 2018 in New York City. Washington (CNN)President Donald Trump’s administration believes the United Nations agency tasked with supporting Palestinian refugees “has perpetuated and exacerbated the refugee crisis,” a senior Trump administration official said Monday. Much of the Trump administration’s Middle East peace plan remains a closely-guarded secret, but emails newly leaked to Foreign Policy magazine and a statement from a senior administration official are shedding light on the administration’s dim view of the UN’s Palestinian refugee agency, known as UNRWA. “UNRWA’s mandate has perpetuated and exacerbated the refugee crisis and must be changed so the Palestinian people can reach their full potential,” a senior administration told CNN in a statement on Monday.